I'm a little late with this one because of my trip earlier this month, but here's the traffic graph for Findory that includes data from the latest quarter. For the first time, Findory's growth shows some mild signs of slowing from the exponential rate we've seen in past quarters, but we're still growing at a healthy pace. Good to see it. 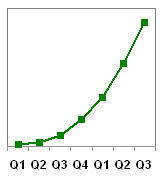 The graph is of total hits per quarter on the Findory.com website. Total hits on Findory.com in Q3 2005 was 9M. Findory launched early January 2004. See also the graph from the previous quarter. I assume you have not included tick labels for a reason, e.g. you don't want your competition to know? No, it's mainly because the graph already small to fit on this blog and that tick marks would force it to be even smaller. Why? Is there something you want to know about the data?